At 2am in our glorious hotel Griyan in Sanur, poor J had an attack of the runs, which persisted until our 10am pick up. We had booked Made again (from luckybalidrivier.com – highly recommended by A&M on their few previous Bali trips and also now by us) to take us to our hotel in Ubud with sightseeing along the way. However, poor J was in no state to do anything but breathe easy and hope to make it to Ubud without ‘incident’. Made was very understanding and happy to drive us directly there, giving us good information about the various areas and villages we passed through along the way. I sat in the back of Made’s lovely air-conditioned van, moving from window to window like an excited puppy trying to see all the sights bombarding me as we drove through each town. All those carvings, and silver, and kites, and paintings... Oh, poor J – I wished we could have stopped an explored. Instead, we were at Alam Indah in less than 45 mins in medium traffic (which was significantly worse as we got closer to Ubud with many large busses semi-blocking the narrow roads). 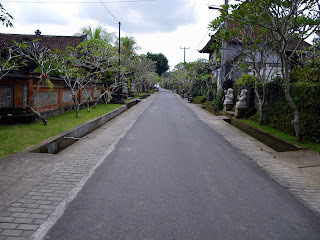 I instantly fell in love with Alam Indah, and Ubud. Somehow, I had a sense of being there before – in a homely, comfortable way. We had the hibiscus room and poor J was up the stairs and lying on the bed a minute after check in. 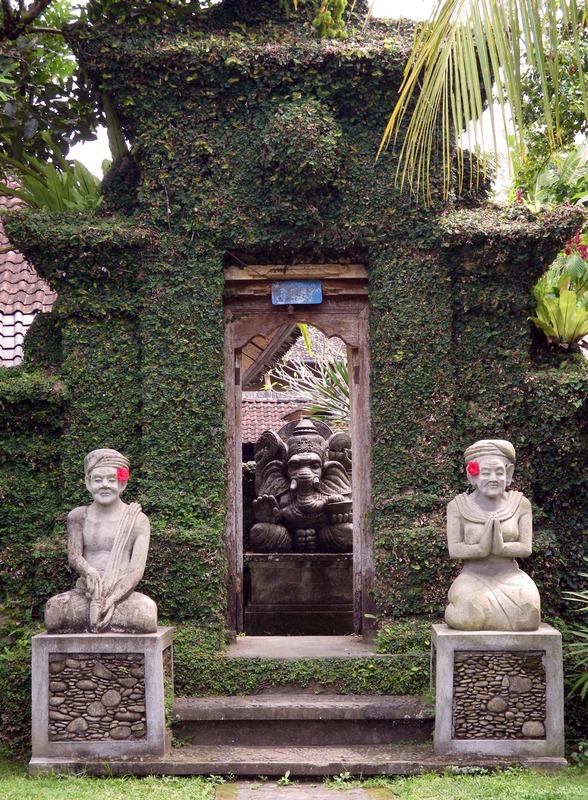 I set about walking around Alam Indah’s lush garden and pathways. A major bummer was that there was maintenance underway on their pool (they emailed us so we knew), but we could use the pool at the other Alam properties if we wanted. That part was great, but that angle grinder went on and on all afternoon. But it wasn’t enough to ruin our stay. Leaving J dozing and close to a bathroom, I took myself for a walk down the road (the opposite direction of the monkey forest) to explore. The small road has a number of wood carvers, textiles and little shops to browse through. But what I loved the most was just the feeling of being in a Balinese village, with all the locals’ compounds, mossy fences, Ganesh statues watching out from open gateways, broody chickens with little flocks of chicks scratching around the roadside, dozens of motorbikes running to and fro, and smiling faces everywhere. I took my time wondering along to the end. I wish I had gone further, as, when we were leaving, we took a right at the intersection where there was a gorgeous little bridge over the Campung (?) river gorge with tall palms standing over the leafy green jungle. Further on were a number of wood carvers with a huge variety of wares on display. But I was too concerned about poor J and wanted to get back and check he was still OK. So the afternoon was spent on the hibiscus room’s balcony day bed with a book, looking up every few minutes to watch the lizards climbing up and down the trees out front chasing insects, or looking down to see monkeys playing the trees below. J slept and by evening was much better. I was starving and checked whether he was up for going to dinner. Laka Leke is almost directly across from Alam Indah and I crossed my fingers he was OK to go. In addition, Mr A & mrs M were already in Ubud (staying at the Cendana which they really liked) and I thought they may like to come see the local dancing there with us. Mr J confirmed he was OK (but would probably only eat steamed rice) but was keen to get out of the room. The dance at Laka Leke was advertised to start at 7pm, but it was actually 8 when it commenced. We arrived about 6 and SMS’ed A&M to tell them to come along. When we asked the staff to help us give directions to A&M to get there, the staff at Laka Leke offered to pick them up and bring them to us, which was great! Before long, Mrs M and I were getting into some wine, Mr A was joking with poor J over a Bintang, and we were exchanging stories and enjoying a delicious meal. That night, the children performed the ‘Joged’ dance. It is different from the other dances commonly seen, as it’s not a ceremonial, temple dance, but one specifically for entertaining guests. There were a few little dances by the groups of gorgeous kids, with a rabbit dance, a butterfly dance and a wonderful ‘baris’ dance, which a solo (awesome) little boy depicts the feelings of a young warrior prior to battle that we all really loved (this line lifted from wikipediea as I wasn’t 100% sure what that little dude was looking so fearsome about), and the joged dance itself. During the joged dance, the dancers invite members of the audience up. Young B was first to be dragged up, followed by both A&M – it was a real highlight watching them. Poor J stuck with plain rice and was ready to get back to bed soon after the performance ended. So we bid our goodbyes as A&M with young B were taken back by the Laka Leke staff to their hotel, and we walked back to our gorgeous hide-w-way hotel. Then it all went pear shaped... I don’t know what time it was, but the pain started in total darkness. At first, it was a few cramps that subsided quickly. Over the next few hours, they escalated to being like child-birth, leaving me moaning and writhing in pain, tearing at the sheets. Poor Mr J still wasn’t 100% and now had me to deal with (let me state for the record, I am not a good patient – I may have a high pain threshold, but a low inconvenience threshold). Strangely enough, between attacks of the cramps, I was kindof ‘OK’ but weak. By morning, I tried to fight on and tried to have breakfast when the sun came up. Bad move. I couldn’t stomach more than a few mouthfuls of coffee and a bite of toast. I crawled back to the room and deteriorated. Mr J took off for the main street to see if he could find a chemist to buy something to help me. By the time he came back with a box of ??? (showing a picture of a stomach with nothing in English) I wasn’t able to keep even a sip of water down. After another urgent trip to the bathroom and pain wracked crawl back to bed, J went to reception and asked for a doctor to be called. The ambulance arrived within 20 minutes and a kind and patient doctor with his nurse had an IV in my arm in minutes, filled with anti nausea & anti cramp meds, as well as glucose and a dose of antibiotics. They took a sample to test and promised to be back in a few hours. I felt better within 30 minutes, and rested until the kind doctor returned with news of e-coli poisoning and a bag of medicines to keep me comfortable and feeling better. You could not get this kind of service anywhere in Australia (or in fact a home visit by a GP – let along personally delivered test results and prescriptions). And the bill for these services you ask.... about 1,600,000 rupiah (translated to $180 AUD) total. We didn’t have that much cash with us, so they took J to the clinic to their EFTPOS machine and delivered him back at no charge. We were thoroughly impressed with the service and made comment on how better off you were getting sick in Bali compared to home, where we frequently can’t even get a doctor’s appointment on the same day. So that was Ubud. I was frustrated. Not only because I’d done next to no shopping, but because Ubud was probably the place I thought I’d love the most. I had plans to see the temples, the terraced rice fields, possibly a trip to the Batur area, and take 1000’s of photos of what I was sure to be the most wonderful scenery. Instead, I took photos of the roof of the hibiscus room and the end of the bed looking out the window. J did make some fun of me (as I would have of him) and laughed that at least he got to do nothing and relax because of my incapacitation, instead of running around trying to see 100 things in a day like my usual crazy pace. By evening, I’d recovered enough (and was completely stir crazy) to stroll through the monkey forest, have a little shopping stroll up Monkey Forest road, and a few mouthfuls of brown rice at Cafe Wayan. Having read all the daunting reports about the monkey forest, I was apprehensive. J told me that his walk through earlier than morning had been nice enough and the monkey were not an issue. He was mostly right. We did see silly other tourists with bottles and plastic bags that the monkeys stole. I mean, come on, the signs are everywhere warning you not to take these items in. I had some baggy pants on and down near the bridge and water fall I was ‘patted down’ by a mature monkey to see if I had anything. We wondered around at a very slow pace (I was only at maybe 50% by now – but had to see it) and I really liked it. I didn’t have my ‘real’ camera with me and my ‘toy’ camera didn’t do any justice to the beauty of this place, or its inhabitants. There was a great photo opportunity around every bend – those moss covered statues, the old logs fallen over the stream, the temples, the bridges, the tall trees blocking out the blistering late afternoon sun (and heat). Everywhere I looked I saw a masterpiece framed with a live compliment of long tailed macaques. Those babies are sooooo cute – and mischief in the making! Out the other end of the forest we came to MK road. I wasn’t expecting to go far as I heard that there was a hill. With my energy level so low, and only propped up by electrolyte replacement drinks (and I have to recommend ‘pocari sweat’ which you can buy from all the convenience stores ready made up, or as a powder to add to water – it works well and perfect regardless if you have Bali belly or not just for shear energy in the hot humid Bali climate). So I dragged myself (and poor J) through many of the stores and stalls along the road, ending at the market. It was almost closing time and a few stall-holders were packing away their wares. My big Ubud purchase was a patchwork bedspread containing lots of different triangles of Bali fabrics. I made the poor stall holder work for it – asking to see many of the neatly folded packages. I like blue and most of them were either very red or brown. I settled on a maroon blue one with a creamy white boarder. 780 was the first offer, already discounted I was well informed. 400. Laughter and something I couldn’t understand. I laughed along. ‘This one good one – hand made – look at all work – nice colour, 650.’ 450. 600, 500. Much smiling and laughter. 600 is good price. Sorry, 500 and I walk away looking at the stalls over the way with patchwork goods.... OK OK 500. Deal. I still don’t know whether it was a good price in the scheme of things, but I was happy. I bought a few little carved items for gift for back home, bargaining only a little. Many more stalls were now packed up or closed. We were heading home tomorrow so I didn’t have any other opportunity. A few more soaps and little gifts bought at one of the fixed prices stores back down the hill of MK road and we had to stop. Cafe Wayan (owned by the Alam group) was on my must do list. The surrounds were worth it alone – so gorgeous! Water falling all around us and a choice of different tables; from sit up regular western style, to on the floor on cushions, to little ‘bungalows’ down the back. Just gorgeous, And so were the staff. Pity food was still my enemy so I ordered gado-gado and ate all the ‘bland’ ingredients. J had an awesome dinner of a local noodle dish. After picking up a few necessities across the road at a convenience store (pocari sweat, dry biscuits and more water), we got a free lift back to Alam Indah. It was maybe 7pm, but I felt like an old towel that had been put through the fast spin cycle one too many times. Sleep came quick and uninterrupted (thanks to buscopan ). Our airport transfer pickup time was 11am. That gave us an hour after wake-up, breakfast, showers, and packing to have a last wonder and look at Ubud. That hour melted away, but in which time we found a local guy called Ali (can’t remember his name for sure now) whose shop had distinctly different paintings from most of the others we’d seen. If you turn right when you come out of the monkey forest instead of going up the main MK road, you’ll find him maybe 75 metres down on the same side as the forest (Tuban Art is the name on the business card). The paintings are done by his wife and father-in-law using traditional designs depicting scenes from Hindu stories. They were each unique. Some using acrylic paint, others using paints made from corals and rocks hand-ground to form the colours. We would have loved to purchase one of the huge canvases, but instead bought a medium sized canvas with a picture of Krishna wielding a chakra weapon on the back of a garuda. It’s stunning. Ali took it off the wood frame and rolled it for our trip home, chatting to us about his business and family the whole time. He told us he was a wood carver, but his wife and father-in-law were painters that were sick of painting the same old pictures that all the tourists buy. They wanted to do something different and more traditional. So they opened their store, which had only been open a week before we arrived. When I walked In, Ali had apologised that he was going to make offerings so was going to away for a few minutes. But as it turned out, we kept him from offerings by asking too many questions, and when we left, Ali was looking forward to making his offerings as well as give thanks for his first sale of the day. He was a great character, and I can say that the paintings in his stall were completely different from all the others we’d seen in Ubud (which admittedly wasn’t many due to the limited exploration that we had done).